Netherlands coach Ronald Koeman says he regrets not making a late defensive switch after Germany scored a last-minute winner in their Euro 2020 Group C qualifying game in Amsterdam. 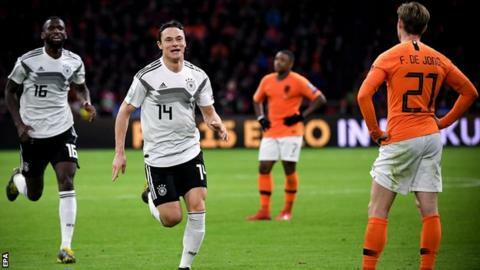 Nico Schulz's goal ensured Joachim Low's side gained revenge over their hosts, who had scored two late goals against Germany in November to reach the Nations League finals. "I wanted to bring in Nathan Ake for Quincy Promes to get the point. Maybe I should have done that," Koeman told Dutch broadcaster NOS. "We got chances for 3-2 and when you are on the field, you can feel that 3-2 is in it. In the final phase, the last two to three minutes, Germany became more dangerous." Like in last year's Nations League contest, the Dutch again recovered from a two-goal deficit. Leroy Sane confidently slotted in the opener following Matthijs de Ligt's slip and Serge Gnabry curled in a superb second to put the visitors in the ascendency. De Ligt's header and Memphis Depay's drilled effort in the second period drew the Dutch level but midfielder Schulz stroked in late on. "What pleases me is that the team never lost the belief that they could win the game, and in the end we got our reward," Low said. Northern Ireland top Group C after beating Belarus 2-1 at Windsor Park to add to their 2-0 win over Estonia in their opening qualifier. Koeman's side, who have also played twice, drop to third place following their agonising loss against Germany, who have only played once. Germany are looking to herald in a new era after a shock group-stage exit at the 2018 World Cup, dispensing with the services of experienced Bayern Munich trio Thomas Muller, Jerome Boateng and Mats Hummels earlier this month. They were booed off by their own fans after Wednesday's 1-1 friendly draw against Serbia in Wolfsburg and it was looking like being another poor result, but Schulz's goal gave them just their second victory in their past eight competitive games. They were much the better team in the first half, scoring twice including ex-Arsenal winger Gnabry's sublime strike, and Manchester City's Sane and defender Thilo Kehrer saw efforts well saved by Jasper Cillessen. The Netherlands have struggled in recent years, failing to qualify for Euro 2016 and last summer's World Cup, and have improved since the appointment of ex-Southampton and Everton boss Koeman, but this was a setback. Fulham winger Ryan Babel should have scored in the opening period but was twice denied by Manuel Neuer and despite getting back into the game, they were unable to hold on. Match ends, Netherlands 2, Germany 3. Second Half ends, Netherlands 2, Germany 3. Substitution, Netherlands. Luuk de Jong replaces Marten de Roon. Goal! Netherlands 2, Germany 3. Nico Schulz (Germany) right footed shot from the centre of the box to the bottom right corner. Assisted by Marco Reus. Substitution, Germany. Marco Reus replaces Serge Gnabry. Attempt blocked. Denzel Dumfries (Netherlands) left footed shot from outside the box is blocked. Corner, Netherlands. Conceded by Antonio Rüdiger. Attempt blocked. Leroy Sané (Germany) left footed shot from outside the box is blocked. Assisted by Thilo Kehrer. Foul by Marten de Roon (Netherlands). Attempt saved. Serge Gnabry (Germany) left footed shot from the left side of the box is saved in the bottom left corner. Assisted by Antonio Rüdiger. Attempt blocked. Steven Bergwijn (Netherlands) right footed shot from outside the box is blocked. Assisted by Memphis Depay. Attempt missed. Toni Kroos (Germany) right footed shot from outside the box is close, but misses to the left from a direct free kick. Foul by Frenkie de Jong (Netherlands). Toni Kroos (Germany) wins a free kick in the attacking half. Foul by Denzel Dumfries (Netherlands). Serge Gnabry (Germany) wins a free kick in the defensive half. Foul by Matthijs de Ligt (Netherlands). Attempt blocked. Virgil van Dijk (Netherlands) header from the centre of the box is blocked. Assisted by Memphis Depay with a cross. Foul by Memphis Depay (Netherlands). Memphis Depay (Netherlands) wins a free kick on the left wing. Foul by Joshua Kimmich (Germany). Denzel Dumfries (Netherlands) wins a free kick in the defensive half. Attempt saved. Memphis Depay (Netherlands) right footed shot from outside the box is saved in the bottom right corner. Assisted by Denzel Dumfries. Attempt blocked. Georginio Wijnaldum (Netherlands) right footed shot from the right side of the box is blocked. Attempt blocked. Memphis Depay (Netherlands) right footed shot from outside the box is blocked. Assisted by Quincy Promes. Corner, Netherlands. Conceded by Toni Kroos. Attempt missed. Quincy Promes (Netherlands) right footed shot from outside the box is close, but misses to the left. Assisted by Marten de Roon. Goal! Netherlands 2, Germany 2. Memphis Depay (Netherlands) right footed shot from the centre of the box to the bottom left corner. Assisted by Georginio Wijnaldum. Offside, Netherlands. Memphis Depay tries a through ball, but Georginio Wijnaldum is caught offside. Denzel Dumfries (Netherlands) wins a free kick on the right wing. Foul by Leon Goretzka (Germany). Attempt blocked. Daley Blind (Netherlands) left footed shot from outside the box is blocked. Assisted by Steven Bergwijn.